This hose is rated at 300 psi for use as a drain hose for residue from cleaning storage tanks and refining hydrocarbons. The black NBR tube material is hydrocarbon resistant. The hose is reinforced with high tensile steel wire braids. 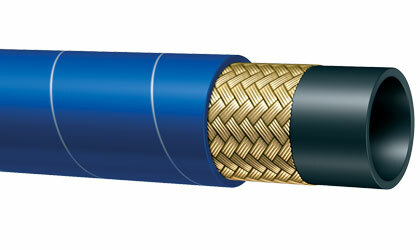 The blue CR cover material is both abrasion and hydrocarbon resistant. Hose is available in a 3/4" ID size. Click here for more info.